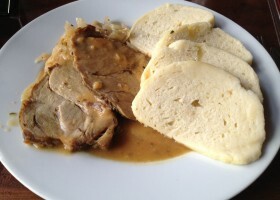 The success of this quintessentially Czech dish depends not so much on the cook's skill as on the quality of the pork. It should be well marbled, not lean; this will result in a succulent, moist roast. The dumplings and cabbage are the perfect accompaniment, though mashed potatoes would do as a substitute. Beer is a must with this meal. Rub the meat with crushed garlic and salt; sprinkle with caraway seeds, and roast. In a metal roasting tin Pour a bit of water under the meat if it’s lean, keep topping up the water during the cooking . Roast covered, later uncovered, until tender. Baste during roasting and allow to rest for 10 minutes prior to slicing and serving. Reserve the pan juices and add to a saucepan, bring pan juices to boil. Gradually add 1/2 cup water or more to make a sauce. Mix butter and cornflour solution to thicken slightly, reduce heat, simmer 5 minutes. For the dumplings, mix all ingredients until combined, add the bread cubes last. The dough should be of medium consistency. Shape it into 2-3 longish loaves (approx. 8”), resembling very short baguettes. Dump them in a big pot of boiling water and simmer for 20-25 minutes. Fish them out and slice about 3/4 inch thick (it’s easily done with a nylon thread, but you can use a very sharp knife too). The dumplings are supposed to be very soft and have a neutral, bready taste - you use them to sop up the meat juices on the plate. Cut the cabbage into thin strips and quickly blanch in boiling water; strain. Sautee one chopped onion in the butter, add the cabbage strips and a teaspoon of caraway seeds (or more if you wish). Cook until the cabbage strips are translucent and tender (if the cabbage is too dry and sticks to the bottom, pour in a bit of water). Season with sugar, salt and vinegar. The cabbage should have a gentle sweet-and-sour taste that complements the heady flavor of the pork. Serve sliced pork with dumplings and cabbage and spoon over the thickened pan juices. Serve with cold beer.